The ETA is a carbon-neutral provider of vehicle breakdown, bicycle and travel insurance for the environmentally concerned consumer. The Environmental Transport Association was established in 1990 as an ethical provider of green, reliable travel services. Twenty-six years later, we continue to put concern for our environment at the heart of all we do. In 1994 we founded a charity, the ETA Trust, to campaign for a more sustainable, safe, and healthy transport future. For every cycle insurance policy, vehicle breakdown policy and travel insurance policy we sell, we make a donation to the ETA trust. We became a carbon-neutral company in 2002, and continually seek further ways to reduce our ecological impact. We also assist our customers to offset the carbon emissions from their own lifestyles, and in doing so, fund vital projects to reduce environmental impacts around the world. We have been applying the highest ethical and environmental standards to our business since 1990 – long before corporate social responsibility became a buzzword – but don’t take our word for it. Once again we have been rated as the most ethical insurance company in Britain, by the Good Shopping Guide. 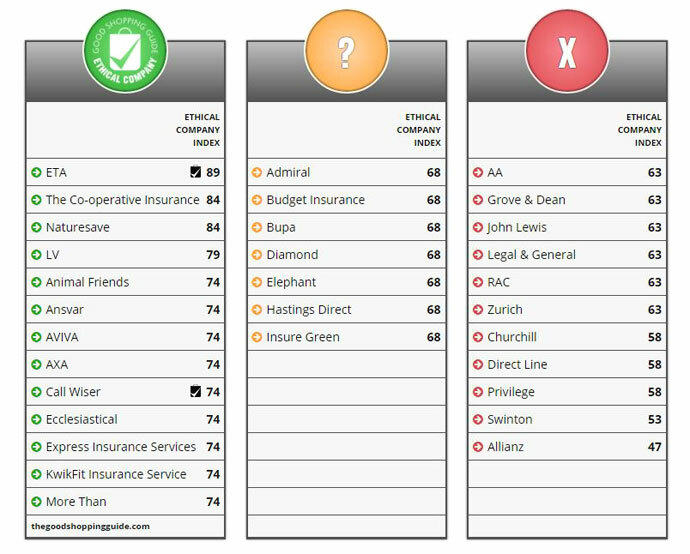 Beating household-name insurance companies such as John Lewis and the Co-op, we earned an ethical company index score of 89. The judging process involves assessment of business practices ranging from environmental reporting to pollution; from workers’ rights to political activity, but much of what defines us an ethical company goes on behind the scenes. From the way we vet our suppliers for robust environmental policies of their own, to the standard of paper used when we have to print, we believe it’s important to practise what you preach (In case you’re wondering about the paper, it’s 100 per cent recycled paper from post-consumer waste, fully recyclable and biodegradable, totally-chlorine free, elemental chlorine free, NAPM approved, Nordic Swan environmental awarded and produced in a mill that holds ISO 14001 certification). It’s an ethos that translates directly into the products we offer. The ETA specialises in breakdown cover, cycle insurance and travel insurance. Cycling has a hugely positive effect on public health, road safety and the environment. We do all we can to support its uptake by providing fully comprehensive insurance policies that replicate the level of cover that motorists have come to expect when they buy ‘fully comp’ car insurance. Over the last 25 years, our own team of cyclists has developed a cycle insurance policy to cater to novice and veteran cyclists alike. It’s why we were the first organisation in Britain to develop a nationwide breakdown service for bikes and why it’s included as standard in every cycle insurance policy we sell. Likewise, we think it’s desirable for cyclists to be covered by third party insurance, so every policy comes with £5m of protection at no additional cost. For more of what we offer cyclists, see here. We don’t just sell cycle insurance; we celebrate life on two wheels. As part of our campaigning for better conditions for cyclists in Britain, we build custom bikes that make a point and generate national debate. If you haven’t already seen the BOND bike or The Hornster, check out the links. With over 5,000 recovery trucks at our disposal, and an average response time of only 39 minutes, our breakdown service is efficient, reliable and competitively priced. Where we differ from the household name providers is that we’ve made a conscious decision not to have a large and fuel-thirsty fleet of our own. Instead, we handpick the best local garages and mechanics around Britain and the rest of Europe and send them to your assistance wherever you break down. We believe it’s more efficient, environmentally friendly and helps supports local communities and economies, too. Furthermore, we offset the carbon emissions of the recovery trucks when they go out to assist you, reducing the impact your breakdown has on our environment. Learn more about our protection for motorists here. The way we travel is a significant factor in how much carbon we are responsible for as individuals; it’s why so much of the work of our charity, the ETA trust, revolves around sustainable transport. Every time you choose our travel insurance you have the opportunity to offset the carbon emissions associated with your trip. We invest only in Gold Standard carbon offset schemes at home and abroad and choose only projects that would not have been possible without support. The way we travel is a significant factor in how much carbon we are responsible for as individuals; its why so much of the work of our charity, the ETA trust, revolves around sustainable transport. We work with climate and development experts ClimateCare to invest in Gold Standard projects that rely on this finance to cut carbon and improve people’s lives. Projects we support include the award-winning LifeStraw Carbon for Water project which provides safe water to more than 4 million people in Kenya, and the largest cookstove project in Ghana, Gyapa Stoves. Find out more about these projects, carbon finance and how to offset your own carbon footprint.